Kiiyolia kiilhswa (Smokey Burning Moon) is one of two moons focused on the cultural fires that Myaamia people used to shape their environment. During the lunar month of kiiyolia kiilhswa (Smokey Burning Moon), grass and underbrush was historically dry enough for the burning of larger and hotter fires. Myaamia people used to regularly burn the woods and prairies in the regions around their villages. 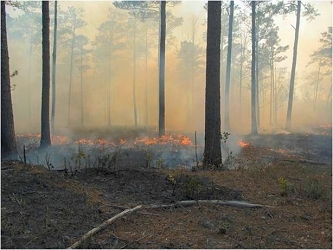 These fires benefited the larger trees of the hardwood forests of our homelands and the mammals and birds who lived there. The Beech-Maple and Oak-Hickory forests of our traditional homelands appeared “park-like” to Euro-American settlers, but these healthy hardwood forests were the result of regular burning from both human lit fires and lightning strikes. Over 1000’s of years the trees and understory (shrubs, bushes, flowers, fungi, and ferns) of these forests evolved to prefer environments that experienced regular burns. Many forest management experts agree that the absence of fire has negatively affected the health of hardwood trees and greatly changed the understory species present in these forests.